Home > Blog > What’s in our Kitchen Kit? 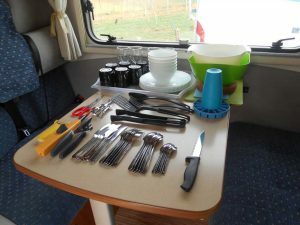 What exactly is in the kitchen drawers and cupboards when you check in to your campervan? The ‘kitchen kit’ question is a common one, particularly from clients who arrive by car, as they want to know what to pack and what not to. 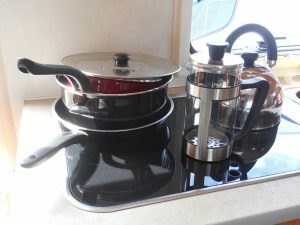 So, we thought it would be useful to add a blog listing everything that’s included in a France Motorhome Hire ‘Kitchen Kit’ – we hope you agree! As you can see, our kitchen kit is fairly comprehensive. If you arrive by air, sea or train and can’t pack something specific, such as a hand blender for making soup or baby food, our local hypermarket sells most kitchen equipment and is just a few kilometres away. Hand blenders, for example, start at just €13 – worth the investment even for a short hire if you really need one. Cutlery, crockery, glasses, cooking tools and, of course, a corkscrew! No greasy kitchen kit here! Between each hire, every kit is removed and replaced by a fresh one. The kits are checked for cleanliness as we assemble them and checked again as we load them onto the campervan. 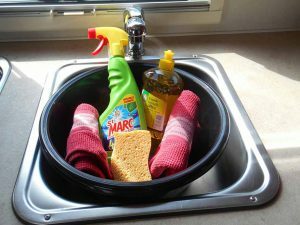 Everything that’s dishwasher safe goes through the dishwasher and everything else is washed in hot soapy water…so you won’t suffer a dirty or greasy kitchen kit if the last client wasn’t great at washing up! It’s self-catering but with all the hassle and unpleasant surprises taken away.